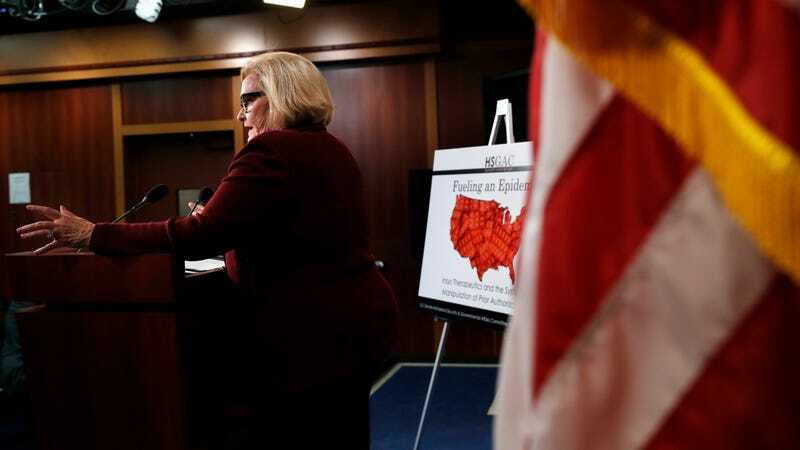 On Wednesday, Senator Claire McCaskill released a report on the findings of a congressional investigation into the practices of pharmaceutical company Insys Therapeutics. The jaw-dropping allegations detail the process in which agents systematically convinced insurers to pay for a highly-addictive opioid cancer pain drug for patients who didn’t have cancer. The case of Insys’s corrupt practices have led to a federal criminal indictment against six former executives on fraud and racketeering charges. McCaskill’s office is leading an ongoing investigation into the complex web of deception that was allegedly employed by the company to trick insurance companies into covering the costs of a sprayable form of fentanyl called Subsys. The powerful opioid was approved for use by cancer patients in 2012 and due to its high costs, insurers required “prior-authorization” before they would pay. But according to the report, Insys found that it wasn’t selling enough of the drug to cancer patients and implemented a program to expand its use through a combination of paying illegal kickbacks to doctors and having salespeople use scripts to mislead insurance reps.
McCaskill’s report details one such call that you can listen to here. In the recording, an Insys employee contacts the insurance company to obtain prior approval and, using a script, gives the impression that they are calling on behalf of the doctor’s office. The employee claims that they are “with” the patient’s doctor’s office and pretends to be flipping through the patient’s transcript and says out loud that Subsys is “intended for the management of breakthrough cancer pain.” With that full phrase being established, the Insys rep then says the patient has “breakthrough pain.” Multiple times, two different employees from the insurance company pressed the obfuscating employee about whether the drug was being prescribed for “breakthrough cancer pain” and each time the rep’s answer left out the word cancer. This technique worked on countless occasions. In this particular case, the slippery Insys representative was calling on behalf of a woman from New Jersey named Sarah Fuller. Fuller died of a Subsys overdose in 2016. The congressional investigation into Insys’s apparent systemic corruption will continue and former employees face their own individual legal troubles. The six executives that were indicted in December have submitted not guilty pleas while other lower level employees have admitted their guilt in the scheme. In July, Natalie Levine, a sales rep who is married to the company’s former-CEO Michael Babich, pleaded guilty to charges of paying illegal kickbacks to doctors. Levine told prosecutors that she taught sales reps to look “for doctors that are money hungry,” and “might be willing to ‘play ball,’” according to court documents. It’s not yet clear where McCaskill’s investigation will lead. Wednesday’s report is part of a broader probe into opioid manufacturers including Purdue, Johnson & Johnson, Mylan, and Depomed.